My 3 predictions for the next year are, 1. Eskom will load shed. 2. The A.N.C will win the elections and 3. You will use a nail art brush! Yup I am a genious. Or maybe not so much, hey I can’t even spell genius. (So grateful for predictive text!). You are a nail technician and nail artist you know how important a good cocktail is Actually what I wanted to say, whether you are a Picasso of nail art or a Michelangelo of acrylic enhancements or simply paint nails. It could be you are renowned for perfectly balanced ombre, natural-looking gels or one-of-a-kind nail art, there’s one tool you going to struggle without – a quality brush. Probably you have a veritable army of brushes. Different sizes, types and shapes etc. You have some for gel some for acrylic (some to stir the aforementioned cocktail maybe?) and a whole lot for art! Some made from synthetic material and others made of natural materials. It is important to take the best care you can of your brushes so they can have a long shelf life. 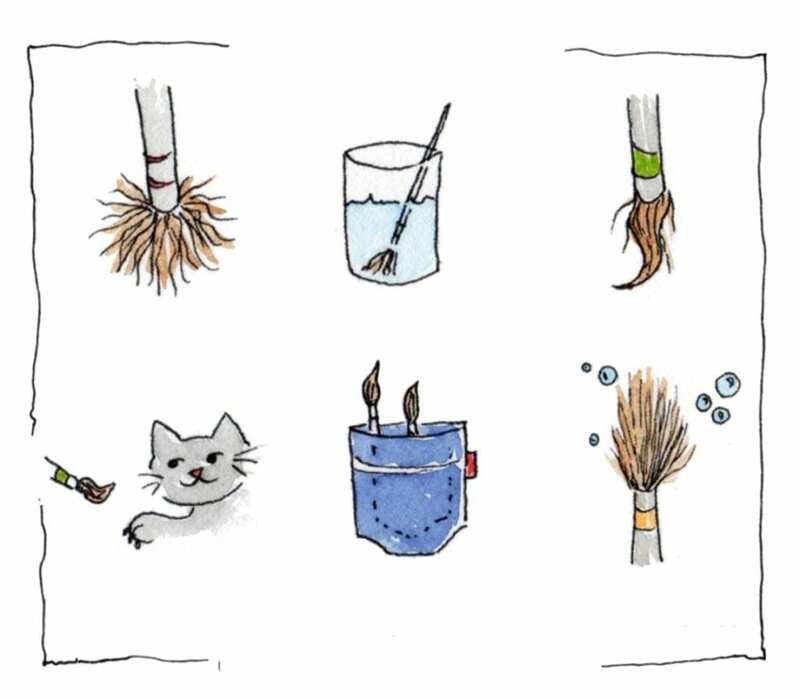 Let us look at some ways to care for your valuable brushes. Luckily caring for your brushes is not so hard however, negligence can destroy a brush faster than you can say “bling.” There are also a few, small things one can do (and avoid doing if you don’t want them to look like above image!) to greatly extend the life of a brush. Sable and kolinsky are little forest animals of the badger, weasel, ferret, and mink family. “Kolinsky” is a general industry term for the winter tail fur of the male Siberian weasel, also known as the kolonok. These are found throughout Siberia and large parts of eastern Asia. The females tail furs are often used to blend a brush, but the male hairs are longer and more prized. They have been the hair of choice amongst artists for hundreds of years because of their strength and resilience. Did you ever hear the story of a young girl watching her mother prepare a ham to bake for dinner? It goes like this. The young girl noticed her mom cut the ends off the ham on both sides. The girl not understanding the need for this, asked why. Mom replied that her mother had always done it that way. Still not understanding the young girl still insisted on knowing why. Grandma was called she revealed the reason: “Because the pan was too small.” Why am I telling this story? Don’t blindly believe “special secret methods” for cleaning brushes (or anything else for that matter). There is a right way and any other ways could kill your beloved brush. The first thing to do is, avoid skin contact with the bristles whenever possible. Oils from the body can deteriorate the bristles over time. Use monomer for cleaning sable and kolinsky acrylic brushes whenever possible. We like using monomer it just works best. Do not use acetone. Even just one washing in acetone can dehydrate the bristles enough to affect their performance. Acetone strips the brush of its natural moisture. 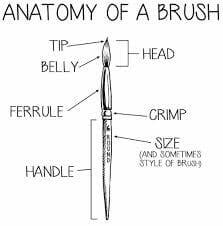 Once the bristles become dehydrated, they will be unable to hold liquids, rendering the brush useless. Acetone will also dissolve the glue that holds the bristles into the ferrule. Keep a small, separate bottle of monomer that’s used only for cleaning brushes, not for nail services. It’s best to use some clean monomer in a ceramic dish to soak the brush while the tech finishes filing the customer. Keeping your brushes free of hardened or clustered acrylic begins by cleaning the brush between each use and at the end of every workday. Brush cleaners may be used for acrylic brushes. Although monomer does a good job of removing acrylic build up and keeping bristles clean during application, sometimes you may need more. AlinaFox of QD nails and Afox studios in Fairmount, Johannesburg, uses monomer during the day to keep her acrylic brushes in perfect shape. “I use QD brush cleaner daily after the day is done, to get dried acrylic out of the brush. I use the cleaner to loosen and remove it, I then immediately put the brush in monomer again, this not only helps clean but removes the cleaner from the bristles” she says. Since cleaner can dry out the bristles of both acrylic and gel brushes, do not soak brushes in cleaner for a long period of time. To prevent fraying or general disheveling of the brush, reshape the bristles after cleaning them. Using your fingertips or a paper towel lightly reshape and re point the tip. If you don’t do this, a brush can develop a bad case of morning hair because the bristles will dry in whichever direction you left them wet. Unshaped bristles can often be corrected, sadly not always. Best is to avoid this situation in the first place, if possible. Should bristles mistakenly get out of shape or bent, rewet in monomer, reshape with fingertips, and then allow the bristles to dry. Alina uses brush cleaner to help shape before re-wetting in monomer. By the way, when dry, it’s normal for natural-hair bristles to look like they spent the night in a heavy metal club. Don’t panic! After a dip into monomer, the bristles should reshape themselves. If not, it may be time for a new brush (more on that later). Is Soap a Good Idea? Some say that if the brush does lose its shape, give liquid soap a try. We don’t agree. Solvents, hot water or anti-bacterial soaps and other harsh things aren’t advisable for cleaning brushes and can in fact cause serious harm. Soap is not for kolinsky brushes! Brushes lack the reoccurring oils that human hairs do, so soap is much too dehydrating for brushes. New brushes often come with a coating or “seal” to protect the bristles. They need to be prepped to remove the coating before the first use. Cleaning brushes for the first time is vital. You’re preparing the brush for all future use and molding it into shape. Firstly, take the protective plastic sleeve off your new brush. Then carefully “break” gum seal on your brush, using a dry nail wipe (this helps avoid too much contact with your fingers) with thumb and forefinger gently “squish” it. Now hold it up under a light, with your thumb and forefinger, if possible still using a nail wipe, gently start to tease the hairs of your brush, from the ferrule to the tip and you will see a fine “dust” coming out of the brush. This is the “gum” residue being removed. Use your thumb or forefinger and gently flick the bristles backwards and forwards. Repeat and work the brush until there is no dust remaining. You will probably find that you lose some hairs as well, do not worry this is quite normal. For larger brushes like the salon acrylic, it can take quite a few minutes to get all residue out of it. Hold the brush over a dappen dish. Run a small amount of monomer down the ferrule and bristles, into the dish. Do not pour above the crimp. It is a good idea to run monomer down the ferrule as there will certainly be some gum there too. Do avoid getting monomer on the handle though. Then dip your brush into the monomer in the dappen, apply some pressure to fan out the hairs on the bottom of the dappen dish turn around brush and repeat, you may notice bubbles coming to the surface. This is trapped air within the bristles. Ensure all air is removed from between the bristles. Rub the brush in one direction, on the rim of the dappen dish to make extra sure all the gum is being removed. Many nail techs put their brush in the dappen dish and leave it in there, we advise you not to do this as it can kink the hairs on the brush and cause damage. Next wipe on a paper towel by “painting” the monomer on the towel. The motion is backwards towards you not side to side, turn the brush over and do the same action again. Then again repeat steps 1-4 until you are sure the gum and air have been properly removed. This can take a number of minutes. After you break in your brushes carefully, they need to dry. The best position to dry is lying flat, in a dry but not airtight environment, far from sources of heat. Rather than submerging her gel brushes throughout the day, Amy Becker, nail technician and owner of Masterworks Innovations in Cedarburg, Wisconsin, gives the bristles a gentle squeeze and wipe between applications. “Simply pinch out any excess product in a clean wipe or paper towel between each use,” she says. Cleaning between applications and services could be just a dry wipe. A proper clean with brush cleaner could be done at the end of the day or even less often, as required. Removing all residue from your brush is necessary. Not just to stop product from mixing, but also to maintain the integrity of the brush itself. You need to ensure that you get all of the gel out of your brush because if it’s exposed to UV light, the gel in the bristles will cure and then you will really battle to remove it. Once again because cleaner can dry out the bristles of both acrylic and gel brushes, it is a bad idea to submerge or soak brushes in cleaner for a long period of time. Now you have your valuable brushes clean and dry. Allow your brushes to dry out flat on a paper towel to absorb any excess moisture. You want to protect brushes from dust. You also want to store them in a non-airtight container or drawer. Ensure that you store them in a way that does not put any pressure on the bristles. Brush hair is flexible and a long period of pressure keeping them bent or fluffed out will ruin the shape of your bristles permanently. Whenever you’re not using your brush ensure you replace the lid (if it has one) or put it away in a brush case or non-airtight container, this will help prevent potential damage and any contamination from things like dust and oils and yes…cocktail stirring or being eaten by the dog! Techs generally store their brushes in a jar or holder of some kind, bristles facing up. That’s awesome but only after they are totally dry. Whilst the brush is still wet, if you keep it standing upright, the monomer captured in the bristles will run down under the ferrule and create problems. It may loosen the glue of the ferrule on the handle, and on the hair of the brush. By the way, those plastic tubes that manufacturers use to protect the brush or bristles in shipping aren’t made for long-term storage. If you can’t keep your brushes in a brush stand or cup, at least make sure the brush is completely dry before placing into an enclosed, non-airtight, case. This helps prevent mold and other disastrous problems. Brushes aren’t into group experiences and are highly claustrophobic. Bristles can bend with the slightest pressure, especially when they are wet, and this can’t always be corrected. Air is good for bristles and brushes, when drying and when in storage, so give your brushes plenty of breathing space! The life span of a brush depends on two things. Firstly the number of services you carry out and second how aggressively you handle the brush. “There is no definite lifetime for brushes,” says Alina. “You need to replace the brush whenever the bristles start to fray.” If you’re finding it difficult to work with product or notice that your fine lines are smudging, that is the time for a new brush. If you apply pressure to the brush and the bristles don’t snap back into place, the ‘snap’ of the brush is gone and it’s time to get a new one. Some good news is that you won’t need a lot of brushes cluttering up your station or storage bins. In fact, one brush should be plenty to complete a full acrylic or gel service. That is one brush per enhancement system. “Using the same brush for different systems can cause contamination of product and service failure,” says Alina. Kolinsky nail brushes are designed to do one thing: apply acrylic for nail enhancement and nail art. All brushes are happiest when they are used with only one medium. Kolinsky nail brushes would love it if you could use something else for anything other than Acrylic. Kolinsky nail brushes were never designed to do many things, like painting a nice picture, being chewed on like a kids pencil or used as the cats’ toy. If you want to try your hand at builder gel or dip into some aquarelle, I can assure you that there’s a brush for that. Save those Sables and Kolinsky’s for the good stuff! Which brushes do I need? Keep various brushes at your station. Even using the same brush for two acrylic brands may cause problems. When doing Acrylic enhancement you will require Kolinsky hair. For gels, you want a brush with synthetic bristles. Why? Gel has a tendency to stick to the keratin in natural hair, synthetic bristles simply work better because gel will not so readily stick to a synthetic brush. Ultimately you will know and learn which brush suits you. That is why there are so many available, you are all individuals and will love different brushes. Choose those that get the job done and are comfortable for you. Let’s all change my third prediction for this year. 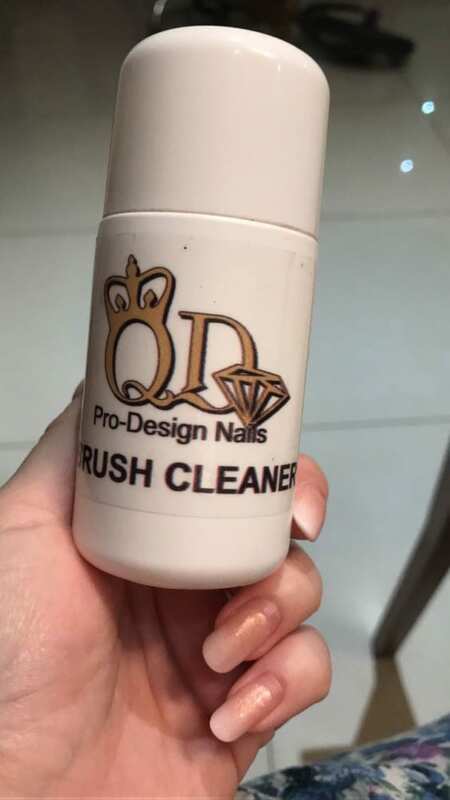 Much better would be “you will use a brush and it will work great for its long life!” Hope this article helped; if you have any suggestions or disagree or want to add to the article please do email us on info@qdnails.com. In the meantime, much like good advice to any man, in caring for his partner. Love your brushes and they will be good to you! This entry was posted in Brushes, News & Updates. Bookmark the permalink.